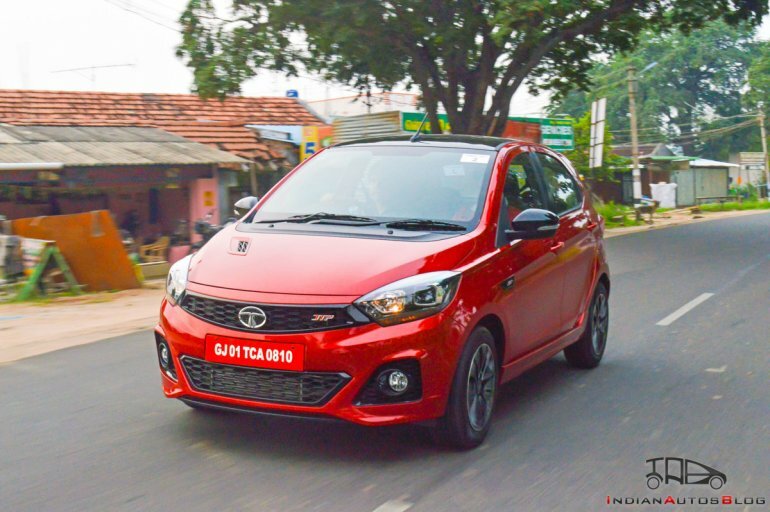 In March 2017, JT Special Vehicles (JTSV), a joint venture between Tata Motors and Coimbatore-based Jayem Automotives Pvt Ltd, was launched for the development of performance-focussed versions of the latest generation models in Tata Motors' stable. At the Auto Expo 2018, in February this year, prototypes of the Tiago JTP and the Tigor JTP made their public debut. 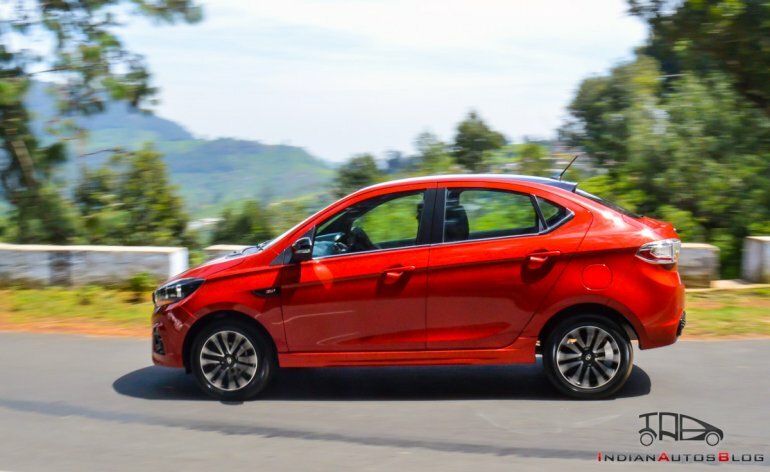 In the months that passed, the go-faster versions of the Tiago and the Tigor have made it to production and are now on sale in 11 cities across the country. The new offerings aren't yet another set of dolled-up models with sporty pretensions. Instead, the rather mundane A2-segment hatchback and its compact sedan sibling have been fine-tuned to offer excitement levels befitting thoroughbred performance cars. 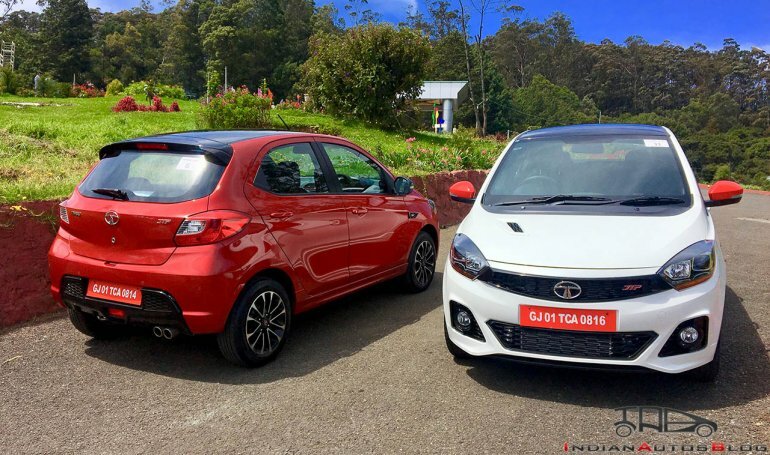 Our Tata Tiago JTP and Tigor JTP review should take you through all there's to know about the souped-up twins. 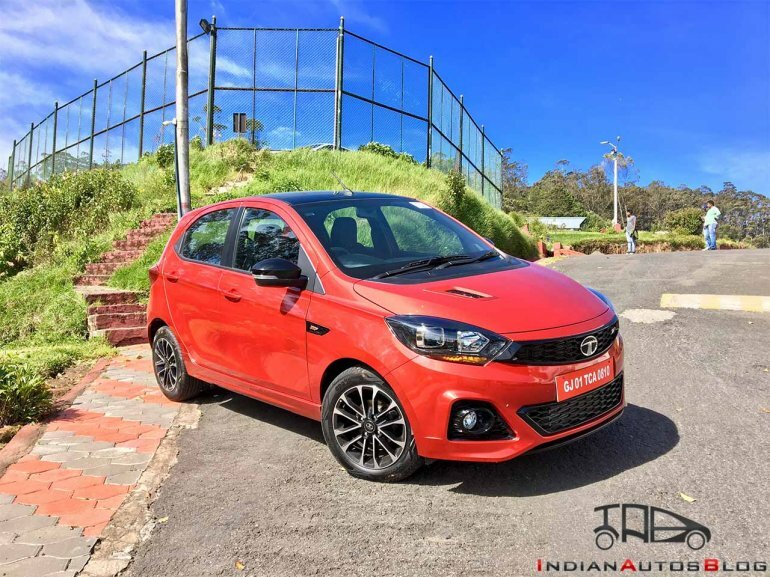 At the front, the Tata Tiago JTP and the Tigor JTP feature a sporty bumper with a large trapezoidal air intake and a pronounced diffuser, an updated grille with JTP logo, revised mesh pattern, and a hood vent. Another highlight of the fascia is the set of dual-pod projector headlamps with chrome accents. The revised side profile carries contrasting ORVM caps, faux fender vents with JTP badges, stylish 15-inch dual-tone machined alloy wheels, and bold side skirts. The rear is characterised by updated bumpers, JTP branding, and a twin-barrel muffler cutter. Moreover, both the Tiago JTP and the Tigor JTP sport a roof-mounted black-coloured spoiler. Rounding off the visual tweaks is the contrast paint finish for the roof. The interior mirrors the sporting theme which is owing to the several styling updates that emphasise on the dynamic nature of the car. The all-black cabin features contrasting red stitching on the steering wheel, a red motif on the black seat upholstery, red sewing on the leather cover for the steering and gearshift gaiter, and aluminium sports pedals. Red accents are sprinkled around the cabin, and the instrument pods feature a JTP branding. The chrome-finished door handles, along with a Harman-sourced 5-inch touchscreen infotainment unit, lend a premium appeal to the entire setup. The only grouses we have are with the fit-and-finish of some parts and the lack of a camera for the reverse assist system. That said, we are highly appreciative of the careful selection and prudent usage of the visual upgrades that take the sporting appeal of the cabin several notches. Powering the Tata Tiago JTP and Tigor JTP is a performance-tuned 1.2-litre REVOTRON three-cylinder turbocharged motor that outputs a maximum power of 114 PS at 5,000 RPM along with a peak torque of 150 Nm at 2,000-4,000 RPM. The engine comes mated to a 5-speed manual transmission. 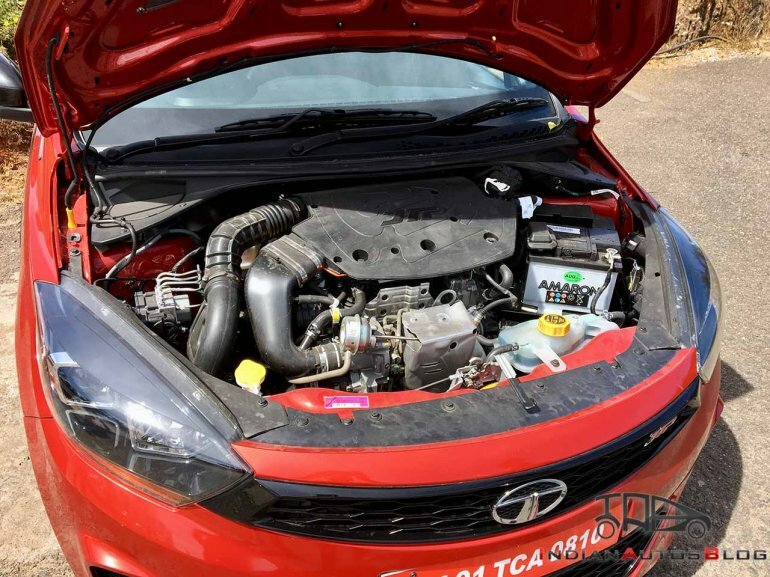 The engine is based on the unit that powers the petrol-sipping Nexon. For the JTP twins, however, it features an upgraded fuel map setting, re-designed intake system and optimised valve timing to develop a marginally higher power at the same engine speed, but the torque output sees a dip of 20 Nm. 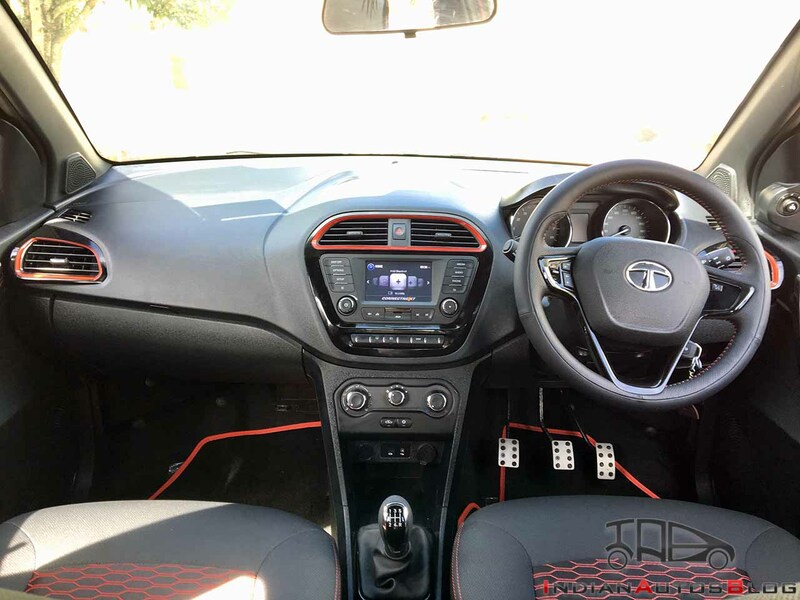 Although the Nexon features a 6-speed manual transmission, the JTP-developed versions of the Tiago and the Tigor retain their five-cog units, albeit, with highly revised 1st, 3rd and final drive ratios. The company claims that the Tiago JTP can accelerate from 0 to 100 kmph in just 9.95 seconds. The Tigor JTP, which is 35 kgs heavier, can dismiss the ton from a standstill in 10.38 seconds. 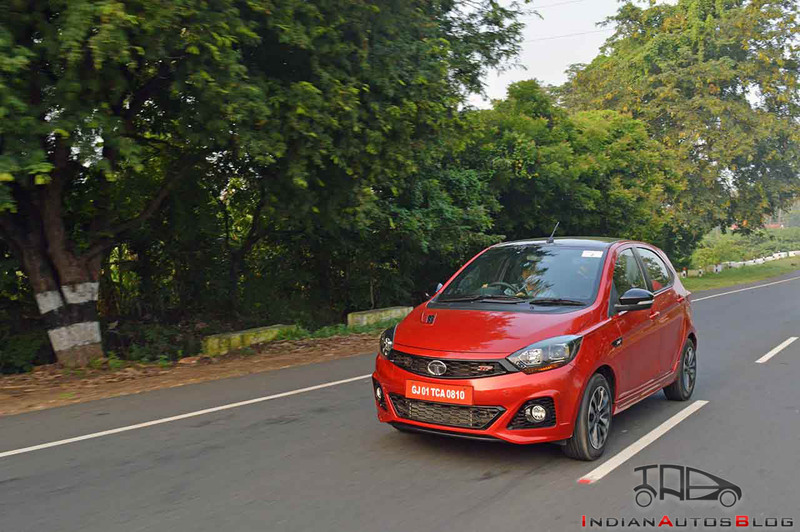 On the go, the Tata Tiago JTP and Tigor JTP feel absolutely nothing like their regular versions. There's a certain increment in the performance, with the cars being sprightlier right from the word go. The torque steer has been kept under a check, while the gearbox offers consistently smooth and accurate shifting. The 1st and the 2nd ratios are short, but the third ratio is relatively much taller. This helps you stay in the power band of the engine in a wide range of speeds, thereby reducing the need of frequent gear shifts. The turbo lag is well controlled, and there's a remarkable surge in power right from 2,000 RPM till almost the redline. The sports-tuned exhaust system provides a delightful bassy exhaust note. While the significant increase in the power output makes the Tiago JTP and its sedan sibling a lot of fun in a straight line, it’s the suspension setup that makes these cars exciting. The handling characteristics of the new models are entirely unlike those of the donor cars. These performance-tuned models stay entirely planted at high speeds and can be pushed hard into a corner. The steering gains weight as speeds rise and are reasonably precise. The body roll is conspicuous by its absence, which means high-speed apex hunting never gets unnerving. The dynamic capabilities of these cars easily surpass the limits of the Apollo Alnac tires that they come fitted with. In most usage conditions, however, the grip levels offered by the 185-spec tires suffice. A trade-off for the excellent handling characteristics is a slightly harsh ride at moderate-to-high speeds. The stiff suspension settings lead to most of the sharp undulations filtering into the cabin. The ground clearance, at 166 mm, however, is sufficient to tackle most of the ill-planned speed humps and deep craters with considerable ease. 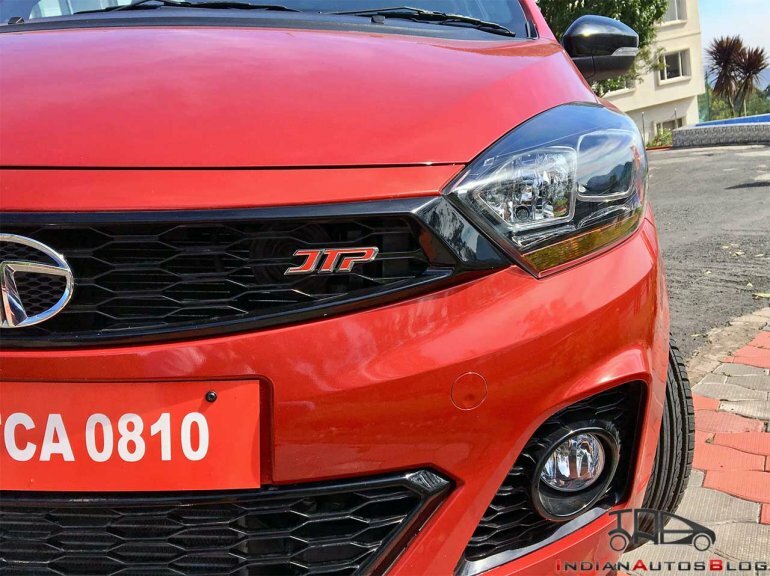 JTP insists that the stock suspension setup of the Tiago JTP and the Tigor JTP has been almost wholly retained for their JTP versions. Of course, the tuners have made several refinements to enhance the road handling capabilities of the two cars. Both the models receive revised spring ratings and a 4 mm reduction in the ride height. Furthermore, the 14-inch alloy wheels and 175/65-spec tires of the regular hatchback, and the 170/65-spec rubber available on the sub-4-metre sedan sibling have made way for 15-inch wheels shod with 185/65- and 185/60-spec footwear on the Tiago JTP and the Tigor JTP, respectively. On sale at an ex-showroom price of INR 6.39 lakh and INR 7.49 lakh, respectively, the Tata Tiago JTP and the Tata Tigor JTP are the most affordable performance-focussed cars in the market. Moreover, they are more accomplished than most of the immediate rivals. In spite of retaining the base design, they possess a distinctly racy look. Furthermore, the high-strung 1.2-litre turbo-petrol motor, along with the performance-tuned gearbox, make these cars quick off the block, but it's the road handling manners that take the cake. The handling characteristics that these cars offer not only complement the significant bump up in the engine performance but enable them to come across as well-rounded 'desi' performance machines.